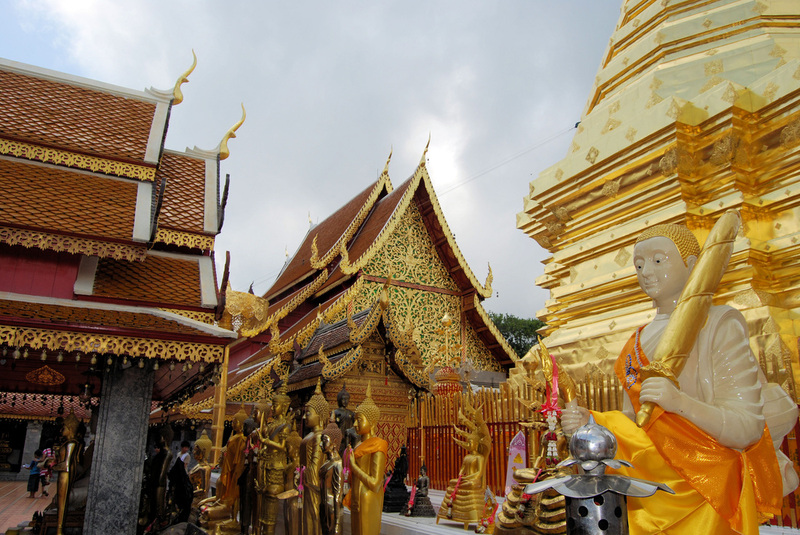 Golden temples perched on mountain tops and a mystical and ancient lost city are just some of the wonders for you to discover here. 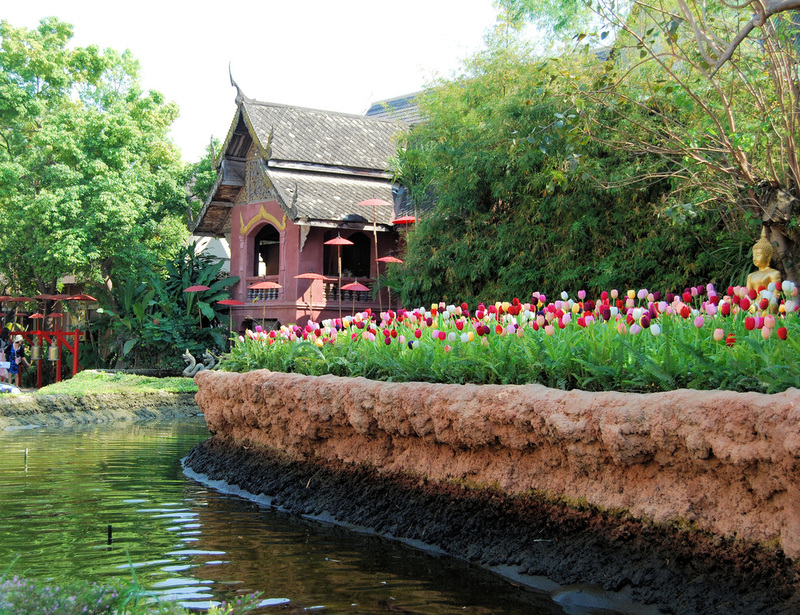 Chiang Mai is steeped in history, yet it is a thriving, cosmopolitan city. The boundaries of the Old City were defined 600 years ago by a romantic moat, now flowered and adorned with many fountains, and medieval city defences, large sections of which are still intact. 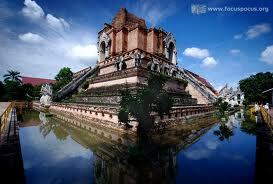 Within the moated area, one can find many of the city’s three hundred and four temples. 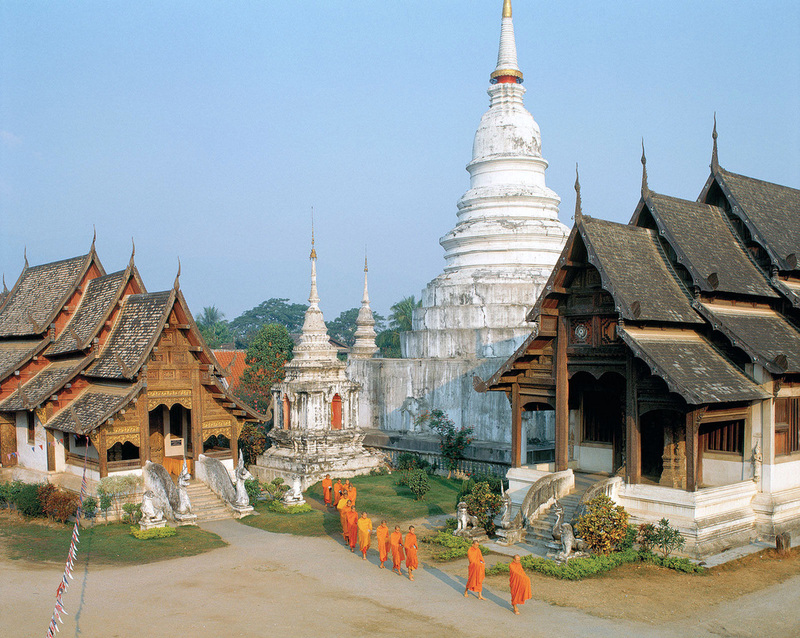 These offer a fascinating insight into Chiang Mai’s history. Chiang Mai is a world-class sightseeing destination where the old and new world coexist flawlessly. 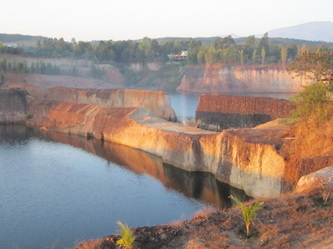 Enforced conservation measures to protect the city’s skyline ensure that no high-rise construction can occur within 93 metres of a temple, the Ping River and city walls. For the most part this has been an effective measure. You will find the highest mountains in Thailand here, as well as countless romantic waterfalls, caves, flowered gardens and geysers. Chiang Mai is also about having fun. 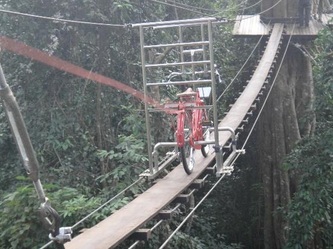 It is about pumping adrenaline, enjoying the outdoors, viewing space beneath, ascending impossibly vertical, crossing rapid water, driving off road, exploring unchartered 12 KM cave complexes, trekking through the jungle, white water rafting and rock climbing at Crazy Horse Buttress and Kewlom, Lampang or rappelling down 530 feet at The Spirit Well Cave in Pai. 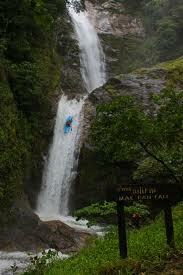 Not to mention canoeing down the Wachiratarn Waterfall at the highest peak of Thailand. A lovely fluent English-Speaking Licensed Tour Guide is available at the resort for 750 THB/day (about $25), or we can book tours for you. 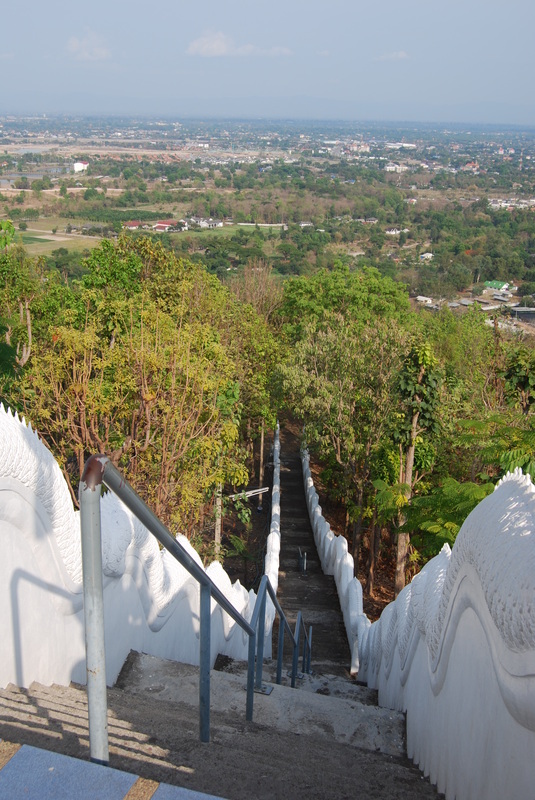 This famous and important temple dating from 1383 enjoys a prominent position in Chiang Mai, overlooking the city from its mountainside perch. It sits about 3,520 feet above sea level and is accessible via a steep naga staircase comprising around 300 steps. The temple has a huge golden chedi (spire), within which lie some holy Buddha relics that attract devotees from the world over. A walk around the grounds reveals a variety of colorful and fragrant flowers, and murals that depict Buddha's previous lives. Any visit to the city is incomplete without stopping by this temple. Cost about 100 Baht to get in and up the elevator. 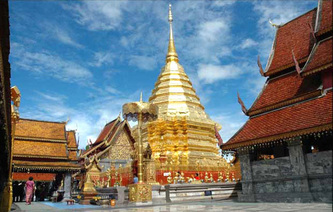 King Mengrai founded the city of Chiang Mai (meaning "new city") in 1296. 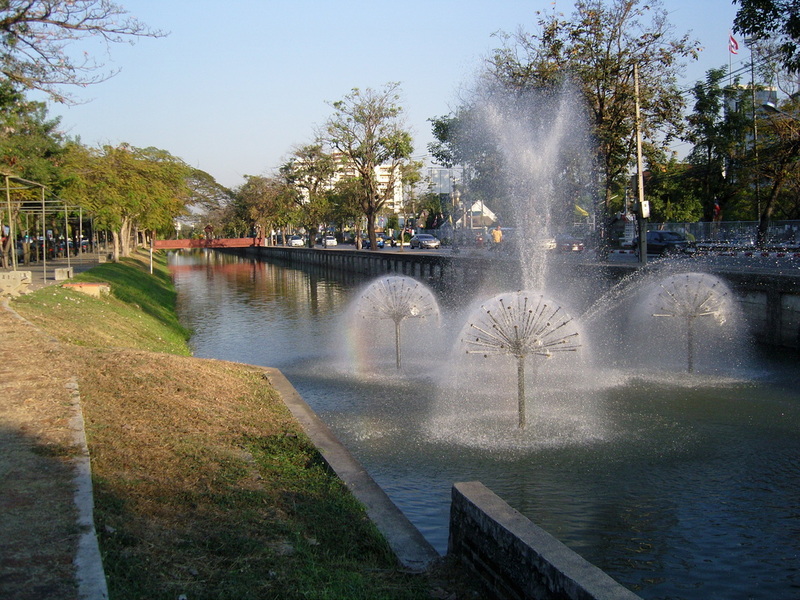 The city was surrounded by a moat and a defensive wall, since nearby Burma was a constant threat as well as the armies of the Mongol Empire. 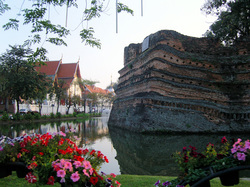 The city moat, the four city gates and defensive walls still form a distinctive romantic feature. 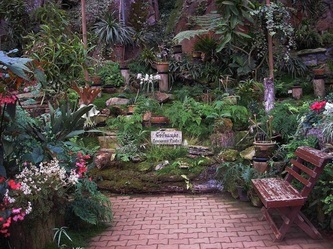 They are adorned with beautiful fountains and flowers. 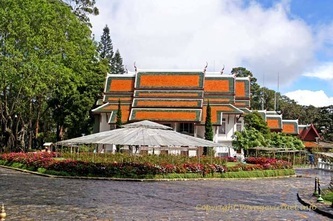 Near the city of Chiang Mai in Thailand there is a little paradise full of beautiful gardens, waterfalls, streams, and - yes you heard me right - traditional Swiss buildings. Many wonderful flowers and photo opportunities. The most romantic place in Thailand. Entrance 500 THB. This temple was built in the period of Phra Chao Maha Proma (1345-1400), which is home to Phra Buddha Sihing, Chiang Mai’s most important and sacred Buddha image. Wat Phra Singh was built inside the old city walls at a time when Chiang Mai was the capital of the northern Thai Lanna or Lan Na kingdom. 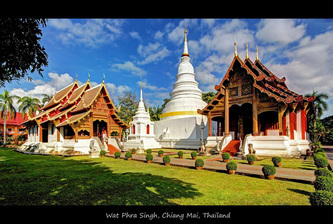 The wat was originally built in 1345. 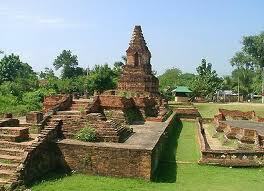 It may have simply been a stupa erected by a king (and descendant of the great Mangrai) to honour his father. 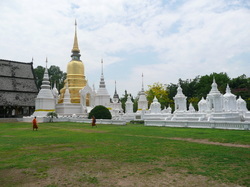 The stupa still stands, but most of the buildings you see on the site today are of much more recent vintage. * Wachiratharn Waterfall: The waterfall is a large ascade which plummets over the edge of a high cliff into deep pool below. 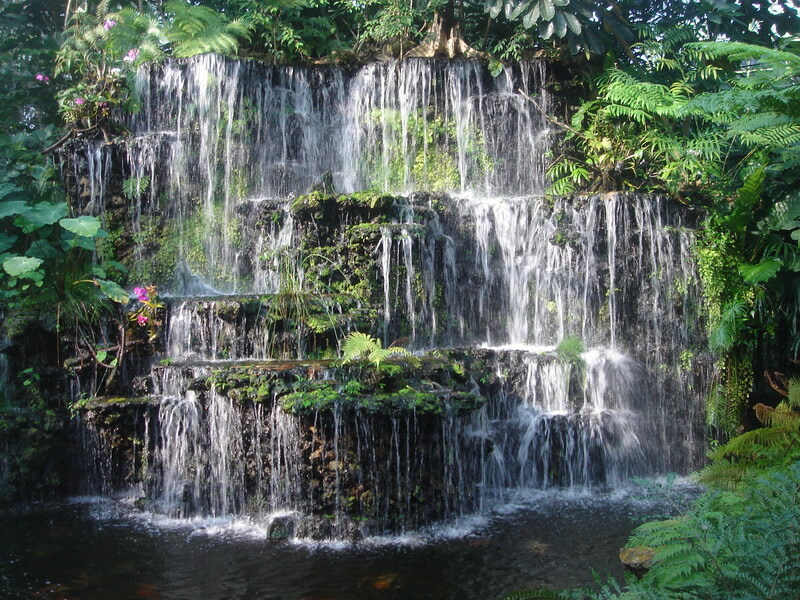 * Mae Sa Waterfall: An 8 tiered tumbling cascade. This waterfalls is one of the most famous in Mae Rim District. 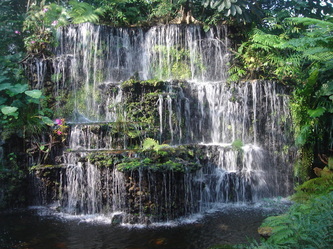 The waterfalls is divided into levels, rising in 8 stages up the slope of the foothills. 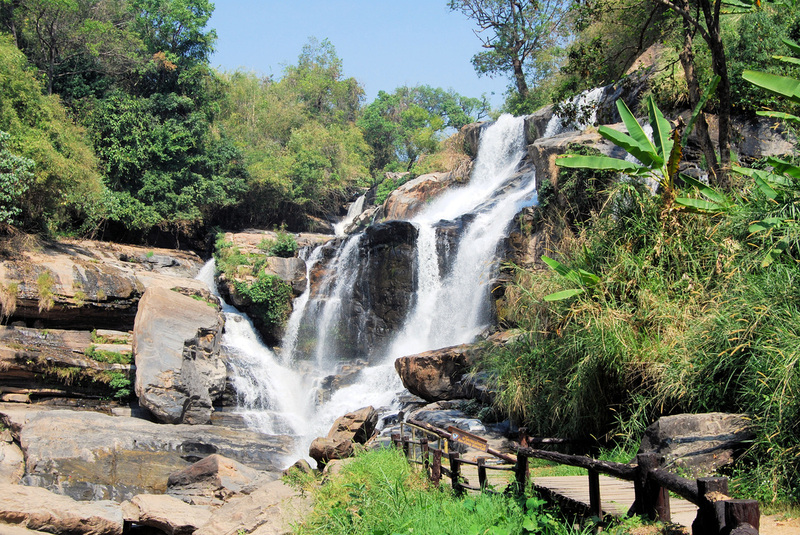 * Siripoom Waterfall: Theisbeautiful waterfall is in fact a pair of falls which plunge from a towering cliff. * Other waterfalls include: Huay Kaew, Mae Klang, Mae Yah Waterfall , Mae Tia Waterfall, Mae Pan Waterfall (see below), Huay Sai Leuang Waterfall, Taad Mork Waterfall, Mae Yim Waterfall, Mok (Morg) Fa Waterfall, Bua Tong Waterfall, Mon Hin Lai. 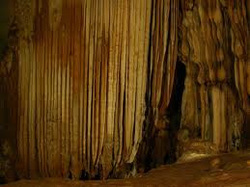 Unless you have your own transportation, it is best to book through the hotel to visit these beautiful caves. It's about 2 hours away from the city. 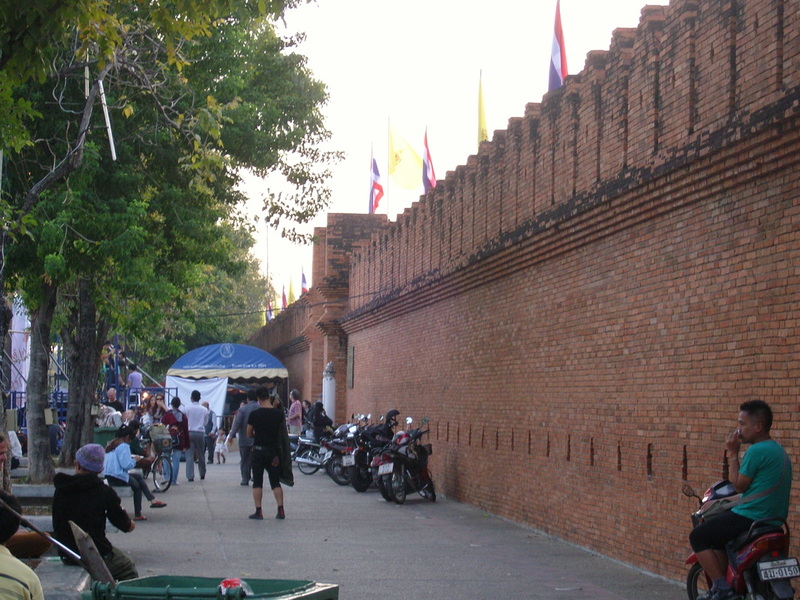 This area is very popular with Thais who, at present, outnumber foreigners by ten to one. 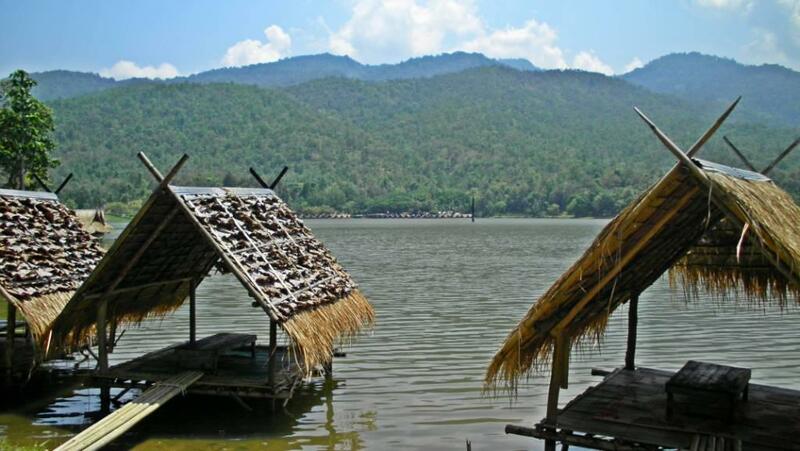 Chiang Dao mountain and cave provides some of Thailand's most beautiful scenery. The mountain is the third highest in the country, but probably the most dramatic of all to look at. 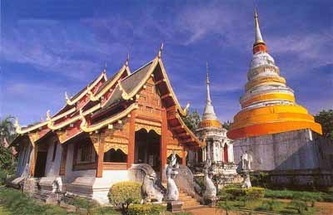 The sacred caves are filled with Buddha images belonging to Wat Tham Chiang Dao. 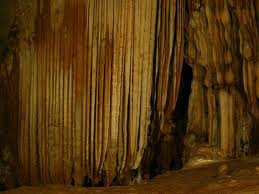 The upper parts of the caves are the most easy to explore because lighting is installed there. If you wish to venture deeper, you should be accompanied by a guide. Cost about 150 Baht to get in plus guide. 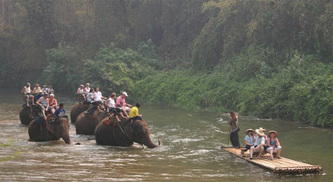 This 1,005 square-kilometer Park located about 1 1/2 hour south of Chiang Mai City is, in parts, mountainous and wild. Perhaps its biggest draw is Doi Inthanon, Thailand's tallest mountain. 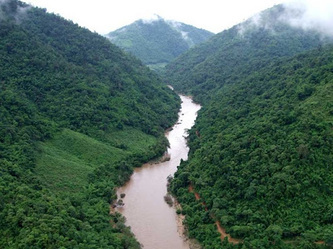 Standing at 2,565 meters, it offers one of the best places in Thailand for bird watching. 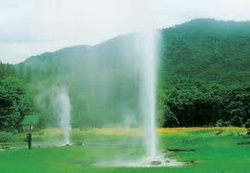 Other attractions include Wachiratarn Waterfall, twin stupas dedicated to the king and queen and hill-tribe villages. On higher ground, one can see wild orchids growing. Entrance and parking is about 500 Baht. Temple built on what were once a 14th-century monarch's gardens. 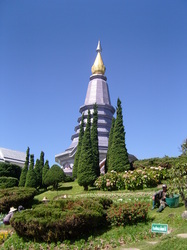 Some of the temple's chedis (spires) contain ashes of Chiang Mai's royal family. Also, one can see half of a holy Buddhist relic brought from Sukothai in 1371, which unfortunately split into two upon arrival in Chiang Mai. The other half is buried at Doi Suthep. 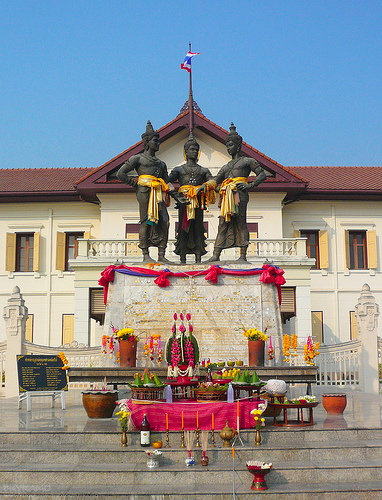 A 500-year-old bronze Buddha image, one of the largest in northern Thailand, is also housed here, in the small hall at the back of the compound. Located in attractive countryside about five kilometres south of Chiang Mai along the Ping River, Wiang Kum Kam is an ancient city dating back to the eighth-century Haripunchai Kingdom. Expect to see many interesting items and structures such as stone tablets with Mon inscriptions, Buddhist sculptures and architecture, earthenware and pottery. Taking a horse-led carriage is a popular way to enjoy the ruins. Open: 08:00-17:00; entry: free, horse carriage tour 200 baht per person, tram 20 baht per person. Wat Chedi Luang's massive chedi (pagoda) was built sometime between 1385 and 1402, during the reign of King Saen Muang Ma, 7th ruler of the Mengrai dynasty and is a distinctive feature of the Chiang Mai skyline. 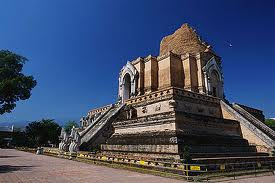 At its peak, the chedi measured 60 metres across at the square base and 80 metres tall and was once the home of the Emerald Buddha, Thailand's most sacred religious relic. Damaged during an earthquake in 1545, the chedi’s height is reduced to nearly half of its original size yet it is still an impressive structure. In 1992, the Fine Arts Department finished restoration work around the chedi, bringing back the naga (water serpent) staircase on each of its faces and wonderful statues of elephants adorning the base. 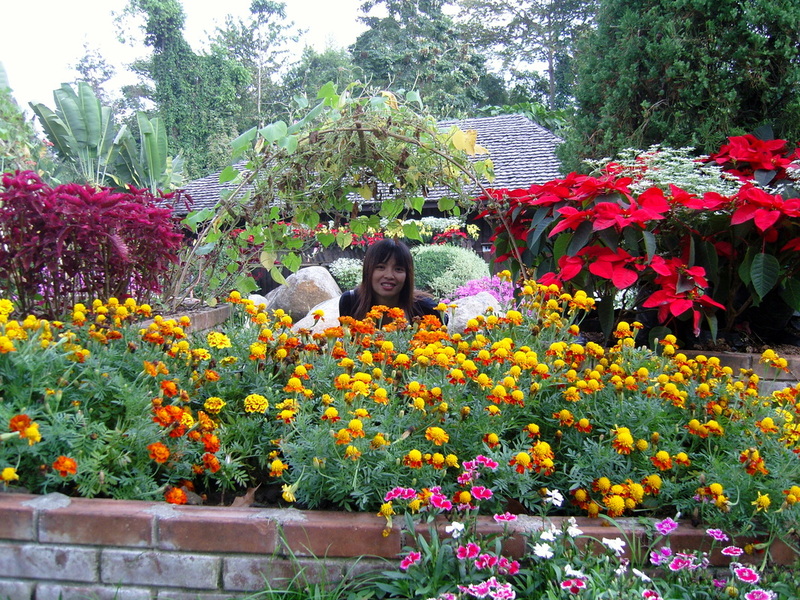 The Ratchaphruek Flower Gardens are a must-see when visiting the Chiang Mai area. The expansive gardens are incredibly picturesque. Bike rentals are available and, for less active travelers, an electric bus is available to take you around. Held 90 days from November. Entrance about 800 Baht. 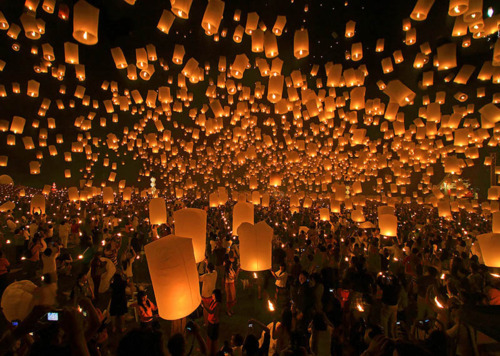 The most beautiful festival in Thailand. Loy Krathong, is held on the night of the full moon of the 12th month of the Thai calendar every year - around November. 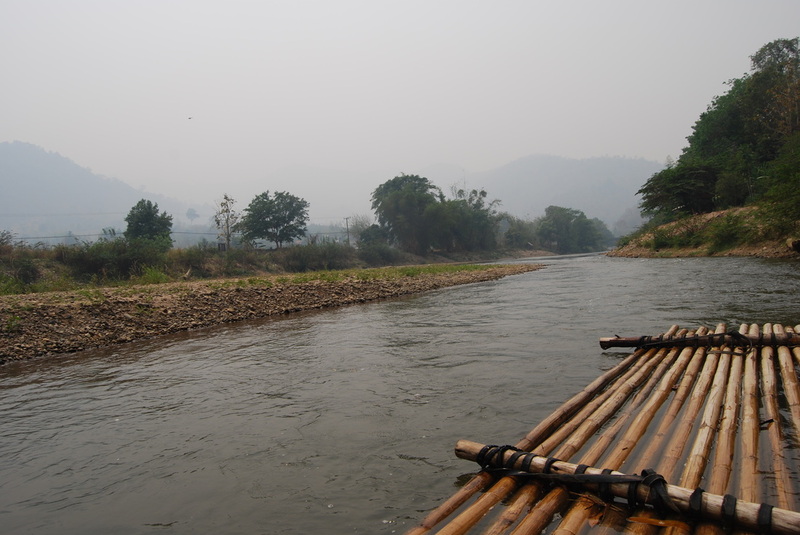 During the festival the rivers become full of floats, known as krathong, which are of different shapes and sizes. They are beautifully decorated with both fresh and dry flowers. With candles lit, they become like stars drifting through the heavens made bright by the light of the full moon reflected on the surface of the waters. 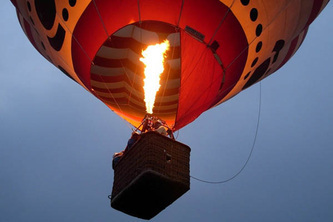 One of the most interesting objects is the colorful khom loy, or sky lantern. 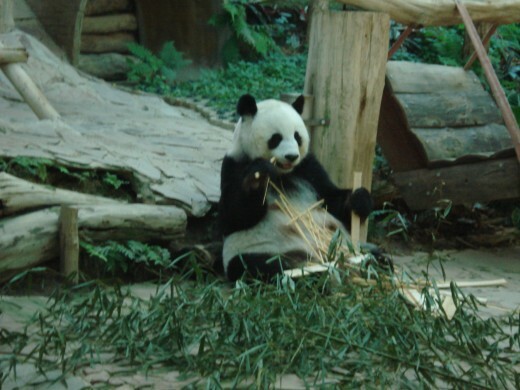 Built in a variety of shapes and sizes, they are released into the sky during the day and night. The lanterns in the sky and the lamps on the ground adorn the sky and the city with a myriad of lights, while all around firecrackers are released in dazzling shows. Once a year the streets of Chiang Mai explode in a kaleidoscopic array of color as the Flower Festival commences. 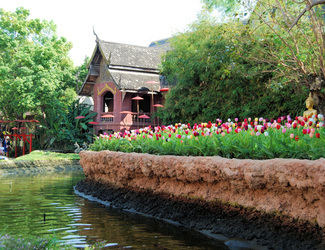 Towards the end of the cool season, in early February, Chiang Mai is looking its best. Everywhere there is a riot of color as temperate flowers such as asters, salvias and marigolds come into full bloom to join the tropical orchids and bougainvilleas. Some fifty villages as well as other private and government organizations compete to create the most spectacular floral floats. These are covered overall with flower heads in intricate designs and made in the shape of dragons, castles, mountains and so on. 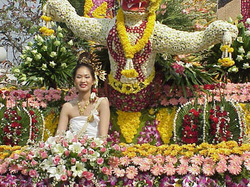 Atop each float sits a beautiful girl dressed in sumptuous northern Thai costume. The procession wends its way slowly through the streets of the city, which is lined with throngs of people cheering. second day was an in-between sort of day when people prepared for the New Year which would start on the 14th. 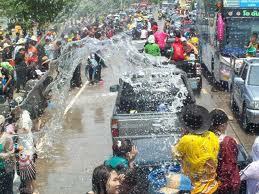 It was a day of fun and relaxation and the throwing of water intensified. Girls were allowed and encouraged to become physically and sexually aggressive, bawdy singing competitions were held between groups of boys and girls. 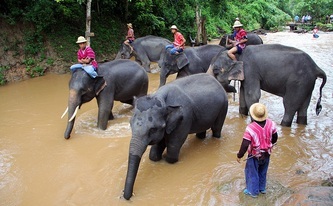 Much of the pageantry associated with the Sonkran Festival - the Beauty Competition, the parade of girls on bicycles, the dances and drumming displays, etc.- have been newly created for the benefit of tourists. along paths through the forest and fields surrounding the village. 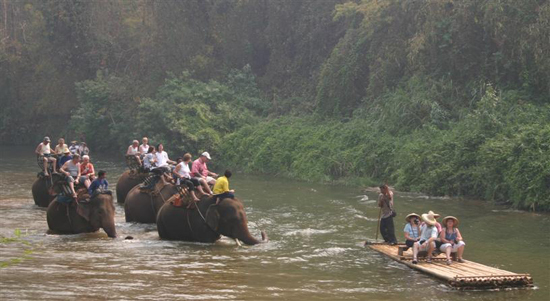 Entrance: Elephant trek, Ox cart ride, elephant show, elephant painting, Bamboo rafting and buffet lunch. and follow it for 9 kilometres, then a 10 minute walk will bring you to the falls. Surging over a 100 metre high cliff, the white of the racing water stands out dramatically against the deep green of the surrounding forest. As the water hits the rocks below, a million tiny drops split the sunlight into rainbow colours and soak the vegetation nearby. Downstream from the falls are a series of pools where the traveller can swim in the chilly mountain waters. The sala on a mound close by the falls, affords a shady place to sit and enjoy a panoramic view of the waterfall. Be sure to visit the Night Bazaar. Stallholders line both sides of the street and prices are really competitive. 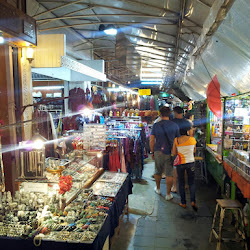 Inside the main market building, on the bottom floor, there are a lot of local handicrafts and artists' works, also at great prices. One of the best things about the market is the food court on the opposite side of the road. You can enjoy your food in a fairylight garden setting, and there's free entertainment such as traditional Thai dancing on a large stage. The reason people come to the area is primarily to shop and absorb the lively atmosphere. Other pulls of the Night Bazaar are entertainment focused with a varied selection of bars featuring live performances of boxing, cabaret and singing. Flight of the Gibbon is a unique zipline canopy experience that lets you "fly" through the pristine, 1,500-year old rainforest near Chiang Mai, Thailand. 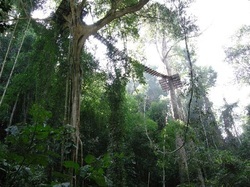 After a short hike into the scenic rainforest, our friendly Sky Rangers safely lead you through 24 platforms, sky bridges and lowering stations that connect 5 km of ziplines. 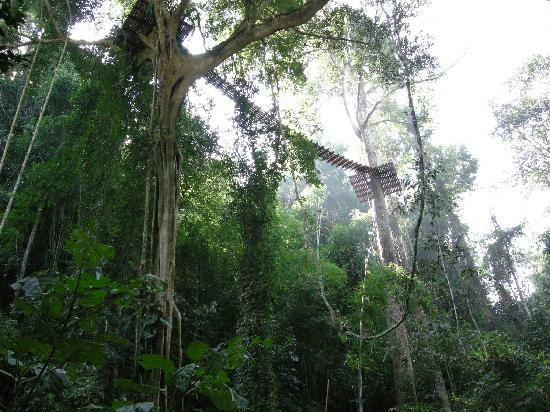 Discover firsthand the beauty of the rainforest ecosystem and experience flying with our namesake gibbons. Asia's biggest aquarium. The vast project, on a four-acre plot next to the city's zoo, features a walk-through underwater tunnel more than 160 yards long. 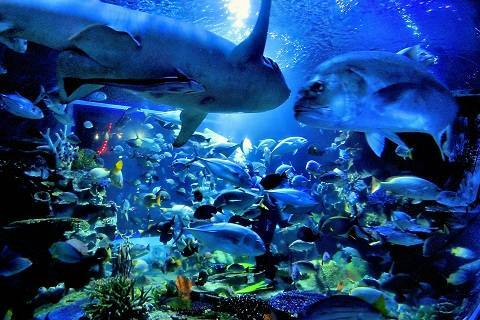 About 8,000 aquatic creatures, embracing 250 species, stock the aquarium. Several varieties of sharks, including the Great White, swim around visitors as they make their way through the viewing tunnel. Entrance Fee is about 500 THB. Open 9-9. 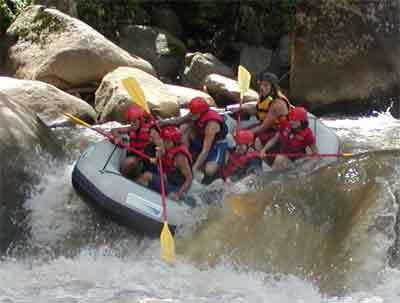 Includes: Instruction, transportation, equipment, lunch, snacks, fruit, water, and insurance. 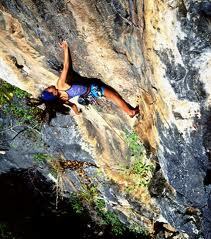 Do bring: Sports shoes and comfortable clothing that you can move in! The Wualai has been so far known for good quality of silver and lacquer wares. 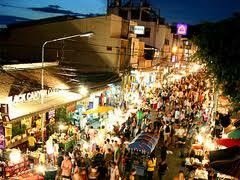 On Saturday evenings, the open-air market is set up in the famous handicraft area. Tourists can enjoy the local foods and Thai traditional performances. The market runs from 4 p.m. to 10 p.m. 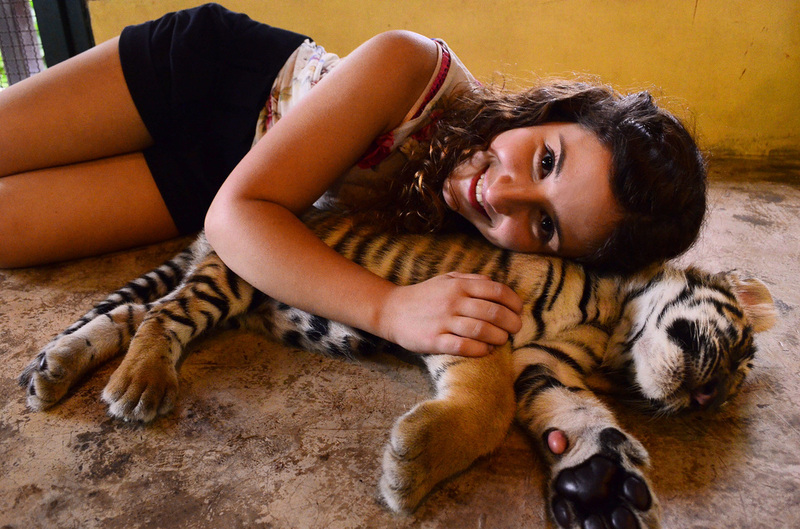 This zoo houses more than 6,000 animals in an environment comprising two waterfalls, reservoirs, an open park, camping spots and animal breeding areas. It also offers some spectacular views of the city. Lovely flowered park and gyser. 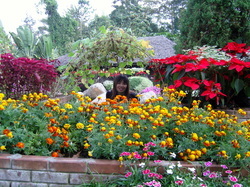 The park has been well landscaped and in the cool season the flowers are very lovely. 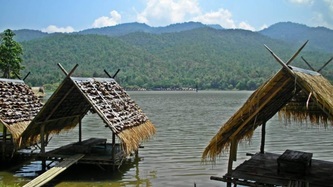 Huts with mineral baths have been constructed; there is a restaurant, a camping area and good places for picnics. This is a very active geological area. The water, at a temperature of a hundred degrees centigrade, comes from a deep source. Entrance Fee is about 50 THB.